Acana Heritage Puppy Large Breed is a dog food for puppies of larger breeds. The food contains 70% protein-rich ingredients. It is also low in calories to help maintain the young dog's weight. Dogs have evolved as carnivores, with a biological need for a diet that contains a variety of fresh meat and fish combined with a small amount of vegetables, fruits and grass. Acana Heritage mostly consists of nutrients that occur naturally in the ingredients. Synthetic ingredients are reduced to a minimum. Young dogs need a protein-rich diet to support their growth, which is why Acana Heritage Puppy Large Breed includes 70% protein-rich ingredients, such as free-range chicken, free-range eggs and wild-caught flounder. This food is low in carbohydrates and calories to help maintain the young dog's weight and reduce stress on the developing joints. Puppy Large Breed is suitable for puppies weighing over 25 kgs at maturity. For puppies of smaller breeds Acana Puppy Small Breed Heritage is more suitable. 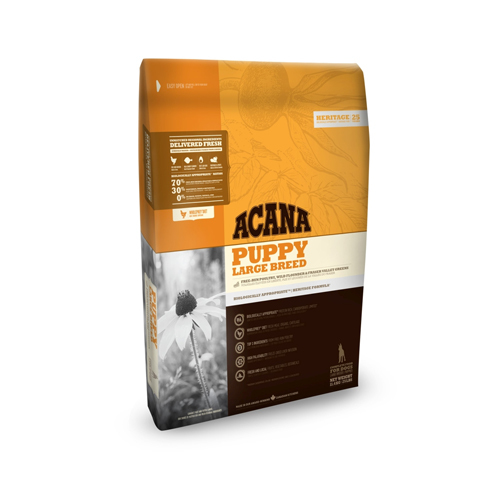 For puppies of medium-sized breeds Acana Puppy & Junior Heritage is recommended. Biologically Appropriate food largely consists of fresh ingredients and matches the digestive structure of the animal. The products do not contain any artificial colourings, flavourings or other additives and are free of GMO's (Genetically Modified Organisms) and antibiotics. Fresh chicken meat (16%), chicken meal (15%), turkey meal (14%), red lentils, whole green peas, fresh chicken giblets (liver, heart, kidney) (6%), herring meal (4%), fresh whole eggs (4%), fresh whole flounder (4%), herring oil (3%), sun-cured alfalfa (2%), field beans (2%), green lentils, whole yellow peas, pea fibre, chicken fat (2%), fresh chicken cartilage (2%), dried brown kelp, fresh whole pumpkin, fresh whole butternut squash, fresh whole parsnips, fresh kale, fresh spinach, fresh mustard greens, fresh turnip greens, fresh whole carrots, fresh red delicious apples, fresh Bartlett pears, freeze-dried chicken liver, freeze-dried turkey liver, fresh whole cranberries, fresh whole blueberries, chicory root, turmeric, milk thistle, burdock root, lavender, marshmallow root and rose hips. Supplements: zinc chelate. Have you used Acana Puppy Large Breed Heritage before? Let us know what you think about this product.